Grundfos dosing pumps for chemicals are leaders in each of their market segments. Digital dosing allows very accurate dosing of chemicals, proven reliability. They are very easy to install, boot and calibrate. In other words, ready to use! 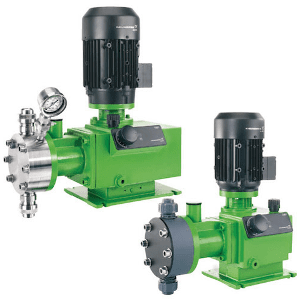 The SMART Digital diaphragm metering pumps (DDA, DDC and DDE) are modular. Simple to use, easy to set up and with a simple and intuitive navigation menu, Grundfos dosing SMART digital pumps offer above all a safe and precise flow control. Thanks to their performance, Grundfos metering pumps have very low life cycle costs. SMART Digital metering pumps can be integrated into industrial water treatment processes such as CIP (Clean in Place), pH adjustment, RO, filtration and coagulation / flocculation. 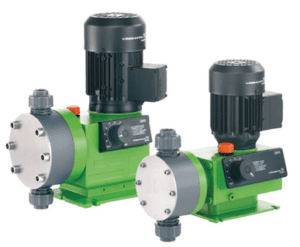 In addition to SMART Digital diaphragm pumps, Grundfos provides motorized diaphragm metering pumps (DMX) and oscillating displacement pumps (DMH) for flocculation, disinfection and pH setting. A wide range of electronic and electrochemical accessories allows you to control your dosing and disinfection processes seamlessly thanks to its integration with your production computer system.